For an effective and efficient service for the individual with an amputation, it is important that the health care team work together towards goals agreed with the patient. A seamless delivery of services can be achieved through adopting of an agreed pathway and interdisciplinary care ceck-list. The physiotherapist plays a key role in coordinating patient rehabilitation. For teams to work well all members must be aware of the roles of other members of the team and to have clear protocols and channels of referral and communication between members. The team should also include the patient and his/her family when developing the treatment goals and recognize the role each of them plays during the whole rehabilitation process. 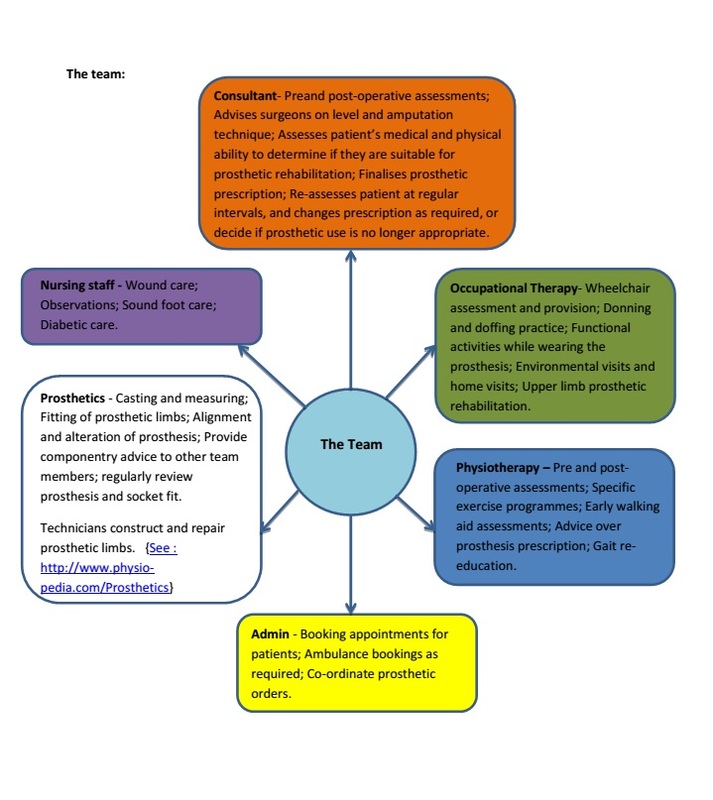 The Multidisciplinary Team (MDT) is a team of professionals including representatives of different disciplines who coordinate the contribution of each profession with little overlap. This term is often used to describe a general hospital setting. A specialist MDT has been shown to result in the best patient outcomes. Professionals working in parallel with clear roles. Each professional sets their own individual goals with the patients and communicates these goals and outcomes with the rest of the team where appropriate. Led by consultant or team leader. Professionals involved in joint problem solving, working beyond their own scope of practice. Treatment goals overlap and collaborate with other disciplines. Regular communication between team members. Korner, compares these two style of working, MDT versus IDT, with a clear outline of how the two approaches differ. Within amputee rehabilitation many limb centres are starting to adopt the IDT approach. As communication between prosthetists, physiotherapists, doctors and other healthcare professionals improve, the team is able to work together more closely and achieve better outcomes. Develop a patient-centred treatment plan that includes comprehensive knowledge and best practice for each discipline. Reduce the risk of missing potential complication factors that may negatively influence operative and rehabilitation outcomes. Enhance patient and family education. 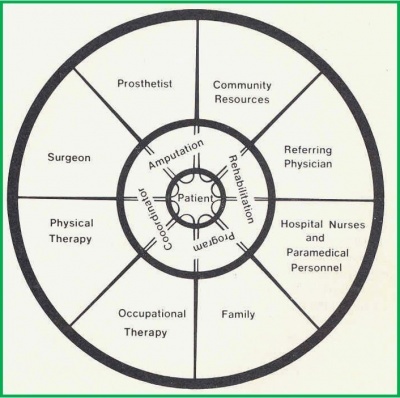 The composition of the team at each phase within the amputee service must be appropriate to the types of service being provided and the needs of the amputee. The patient is to remain at the centre of all decision making and be an integral member of the team that is providing the care. The rehabilitation process should have an educational element that empowers patients and carers to take an active role in their present and future management. The ultimate functional desires and expectations of the patient need to be included in the decision-making process. Key disciplines to be consulted during the preoperative (when possible) and postoperative phases or rehabilitation care include: physiatry, surgery, physical therapy, occupational therapy, prosthetics, social work services, case management, mental health, nursing, nutrition, and recreation therapy. In addition, the following specialties should be available on a case-by-case basis: vascular surgery, plastic surgery, internal medicine, pain management, vocational therapy, and spiritual advisors. The patient and family members (or other caregivers) should be an integral part of the interdisciplinary rehabilitation team. Interdisciplinary rehabilitation team meetings should be conducted on a regular basis within the institution to facilitate communication and integration of a comprehensive treatment plan. Outpatient amputation clinics should have interdisciplinary team participation for the periodic assessment of patients to ensure appropriate life-long care in order to preserve the quality of life, achievement of maximum function, and reduction of secondary complications. Communication within the MDT or IDT is critical and should regularly occur to ensure that the members of the team are informed and aware of a patient’s progress. This is most commonly achieved by a goal-setting meeting. This may be held fortnightly or monthly depending on the limb centre and their service. This meeting allows the team to discuss patient goals (which have been clearly defined in the rehab outcome measure, Canadian Occupational Performance Measure or COPM) enabling the team to decide on patient focused SMART goals. Additionally, the regular meeting ensures that all team members are aware and up-to-date with patient progress; any issues or concerns can be discussed with a joint approach to problem solving. Alternatively, an online system (ie. email, Skype, team working programmes) may be set up, which can be particularly useful for satellite clinics at different hospital sites. This only works well if all team members are trained in using the system, check it regularly and respond in a timely manner. Design and implementation of interdisciplinary care guidelines for hospital management of amputees in Christchurch. Hockley D, Flanagan G. New Zealand Artificial Limb Board. 2005 (in particular see Summary of Results on page 20-24). Multidisciplinarity, interdisciplinarity and transdisciplinarity in health research, services, education and policy: 1. Definitions, objectives, and evidence of effectiveness. Choi BC, Pak AW. Clinical and investigative medicine. 2006 Dec 1;29(6):351. ↑ Pasquina PF, Bryant PR, Huang ME, Roberts TL, Nelson VS, Flood KM. Advances in amputee care. Archives of physical medicine and rehabilitation. 2006 Mar 31;87(3):34-43. ↑ Ham, RO (1985) Rehabilitation of the vascular amputee – one method evaluated. Physiotherapy Practice. 1: 6-13.